YouTube has the popular platform for video uploading, Everyday, every hour, and every second’s YouTube has been growing since it started in 2005. According to the (Last Update of YouTube), In 2014 YouTube said that Every 300 hours of every new video were uploaded on YouTube Site on every Minute. From there, we can estimate how much video would be uploading on YouTube and Watched by the viewer. About 5 billion videos are watched each day on YouTube. Well in today’s article we will be going to share some of the best and most watched YouTube Videos. Are you excited which video will be the most watched on YouTube and will hold in the first position? The music video for “Gangnam Style” was directed by Cho Soo-hyun. Gangnam Style Video was launched on July 15, 2012. This is one of the first Video, which has reached out over 2.793 Billion Views on YouTube. And currently, hold the record on the first positioning for the longest time watched by the viewers. This song has sung by the American Rapper Wiz Khalifa and Singer Charlie Puth. This is currently in the second position which has most watched youtube videos ever & liked by the Viewer. It completed the 1 Million Views in 184 days on October 7, 2015. And till viral on with 2.544 Billion views. The video Song of “Sorry” was recording by Canadian Singer by Justin Bieber and the song was produced by Skrillex. It was released on October 23, 2015. It almost has 2.347 billion views. And this song currently holds on four positions. This Song is Coming from British and recorded by Mark Ronson and the song script is written by an American singer and songwriter by Bruno. This Video has Over 2.289 Billion Views on YouTube. And its Stand on the Fourth Position in the given List. On 6th Position of music, Video is “Blank Space” this video was released on November 10, 2014, His YouTube channel known is TaylorSwiftVEVO. it has over 6,663,596 Likes 1.996 Billion Views on the Video. 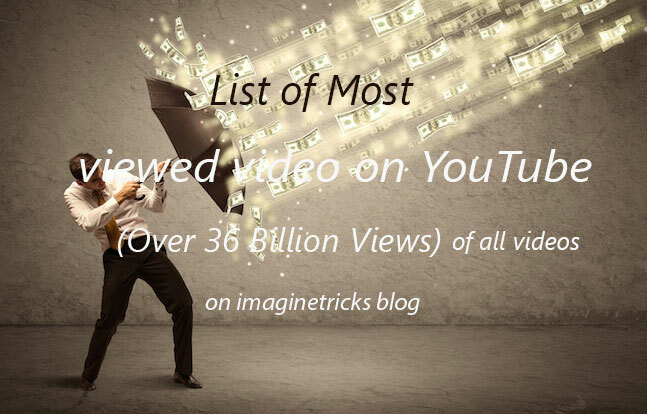 We have Listed the most watched youtube videos of all time. I hope you will Enjoy. Please Share this Post to your Friends & to your Lovers..